Yo Ho (cough, hack, wheeze) Ho! What is your “go to” activity when you are running a fever and have an awful cough? My activity, if you can call it an activity, is to lay in bed and alternate between reading a book and napping. Sometimes there is tea drinking involved and an occasional piece of toast with butter and honey. 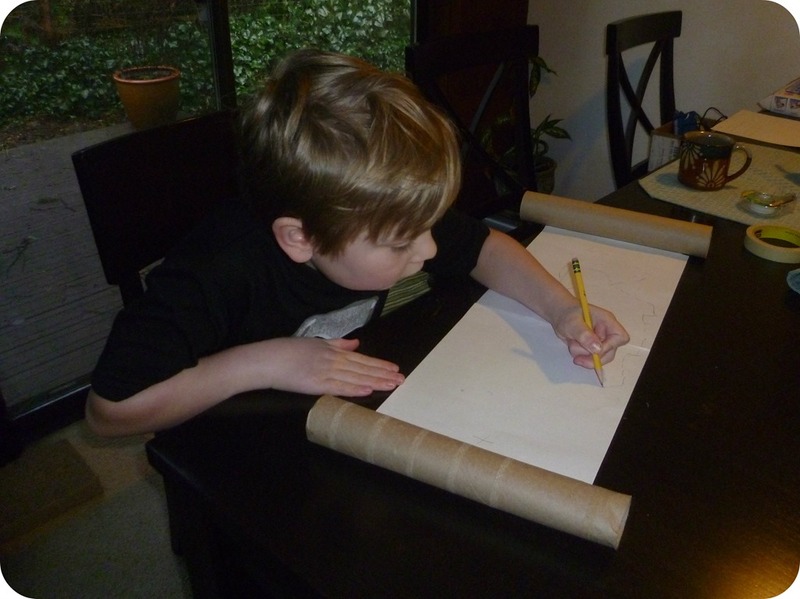 If you happen to be a seven years old boy and your mean mom won’t let you go outside and play in the rain-soaked forest that surrounds your house, you make a pirate scroll map to pass the time. After you have made a most perfect map, complete with an “X” marks the spot and a “Dead End” path guarded by a hammerhead shark, you roll it up. 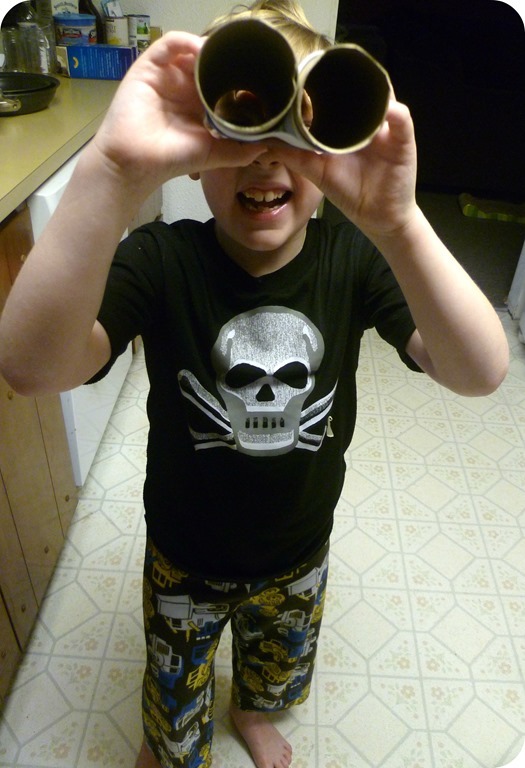 It makes a great pair of binoculars. 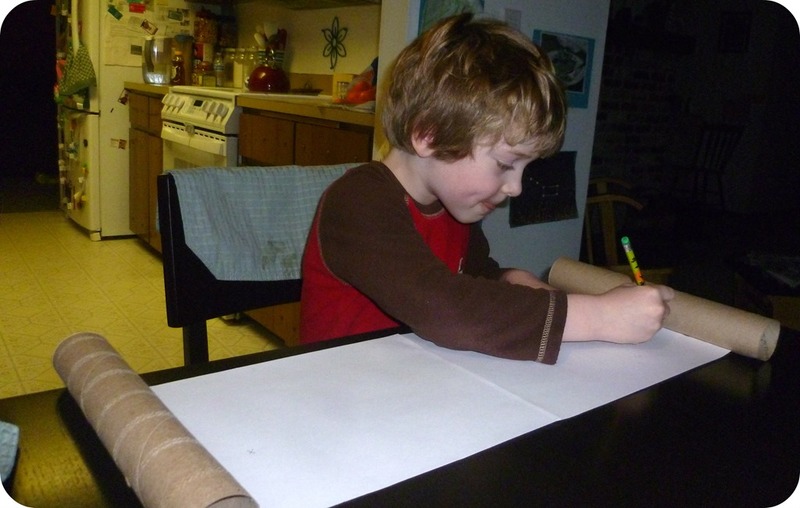 Little brother, who is not sick but has been watching the whole scroll making process, wants to give it a go too. And so he does, full of concentration, his little tongue peeking from his mouth, an apprentice cartographer. Watch out for the school of pirate eating fish! So the next time you find yourself under the weather and looking for an activity to distract you from your ailments, perhaps you should consider making your very own pirate map scroll. 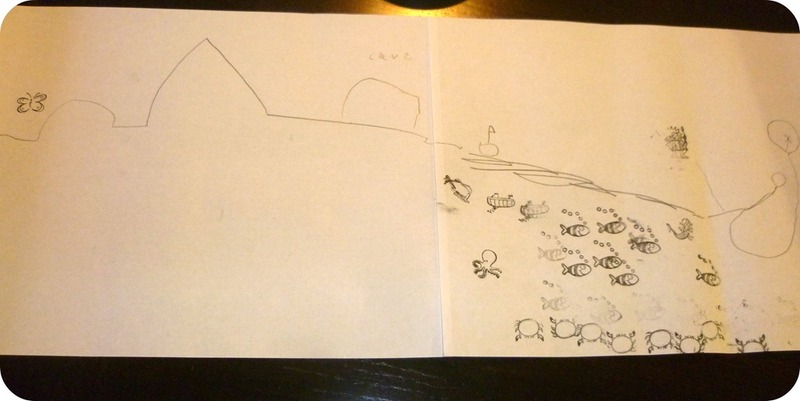 This entry was posted in Sniffles & Seizures and tagged Arts and Crafts, Children, Family, Kids, Life, Pirate Scroll Map, Pirates, sick, Treasure Map. Bookmark the permalink. 12 Responses to Yo Ho (cough, hack, wheeze) Ho! It is crazy the energy they have when they are sick. I am like you, at the barely functioning level when I am sick. Very creative idea. I like it. When I was sick last year and really tired of hearing “mommy!” every few moments, we instituted a rule that they could only speak to me with an English or Scottish accent. It didn’t slow down the “mommy!” yells, but it did at least amuse me a little. What a wonderful rainy-day activity. 🙂 Now that we’ve moved, we have the same weather as you! But this winter really hasn’t been bad at all. We’ve had lots of “sun breaks” to get out there and ride bikes. But we are always looking for new craft ideas — I can’t wait to make these with my kids, they’ll love them! Thanks for the ideas, and hope you are feeling better. It is nice to have these random crafting ideas for rain days and sick days. I can not be the one to take the credit as it was Cody’s idea. We’ve been lying on the couch watching Disney movies…and sleeping. Sounds pretty chill – I like it. Sometimes lounging and movie watching are necessary. Thanks – it was a pretty fun and simple craft that that both boys enjoyed.